Day visitors, wedding parties, conference delegates and extended guests can expect great KwaZulu-Natal game reserve activities, exceptional cuisine and service at Thula Thula. At Thula Thula Private Game Reserve in KwaZulu-Natal, South Africa, visitors can track game and really experience the African bush on foot or in open Land Rovers. Other nearby Zululand attractions such as golf, Zulu cultural tours, battlefield tours and whale watching in season can be added to the outstanding KwaZulu-Natal game reserve activities. The Thula Thula Private Game Reserve in KwaZulu-Natal, South Africa, is home to a diverse African wildlife population, including Elephant, Zebra, Nyala, Hyena, Kudu, Crocodile, Wildebeest, Rhinoceros, Leopard, Giraffe, and a spectacular variety of other indigenous species, great and small. The re-introduction of a family herd of Elephant in August 1999 marks the historic return of these great creatures to the area for the first time in 100 years. Birdlife at Thula Thula Private Game Reserve is prolific with over 350 identified species, including raptors. Guided walking safaris and game drives are conducted by experienced and professional rangers and trackers. This KwaZulu-Natal game reserve in South Africa offers great Limpopo safari activities, which can be combined with sumptuous meals for a fabulous day out. Thula Thula has a private air-conditioned conference room and breakaway lounge with bar, library, TV / DVD. The conference room has a pull down screen for overhead projection and seating for 32 delegates in cinema style. The centre is 150 metres from the main lodge and has great bush views, a private garden, an adjacent refreshment station and WC facilities. All AV equipment can be sourced locally on request. Half day, full day and fully inclusive overnight conference packages are available. Thula Thula Private Game Reserve in KwaZulu-Natal, South Africa, is a dream wedding location in the South African bush. The Elephant Safari Lodge with its stylish décor and unique atmosphere of peace and tranquillity will make any Thula Thula wedding unforgettable. The stunning Suite Royale, elegantly decorated with colonial and ethnic style, is the perfect setting for a most romantic South African honeymoon in the Limpopo Province. Thula Thula Private Game Reserve near Durban has a diverse wildlife population, including Rhino, Elephant, Leopard, Giraffe, Zebra, Nyala, Hyena and Crocodile. 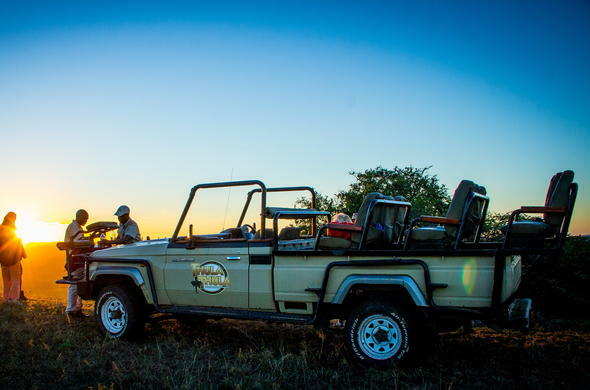 Safari activities at Thula Thula Game Reserve in Zululand, KwaZulu-Natal, South Africa, include game drives in open Landrovers with professional rangers.